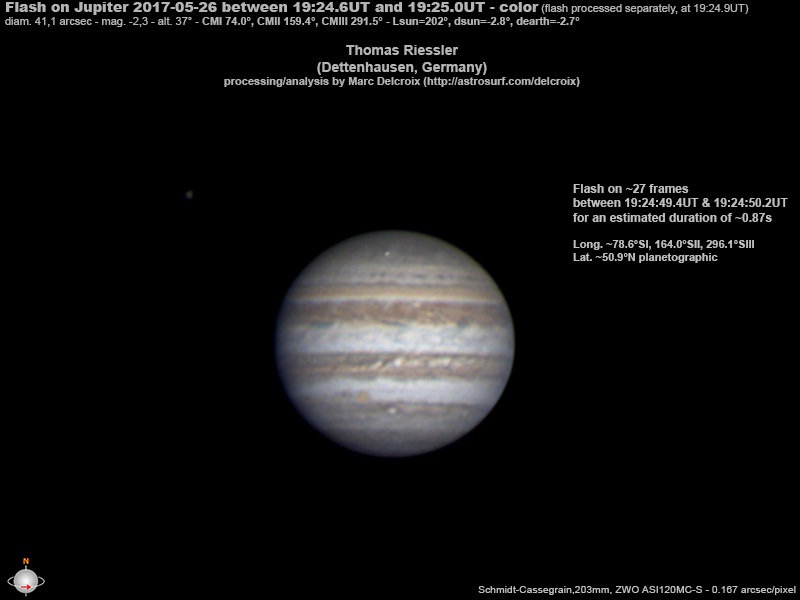 Another impact flash on Jupiter - and I helped confirm it! 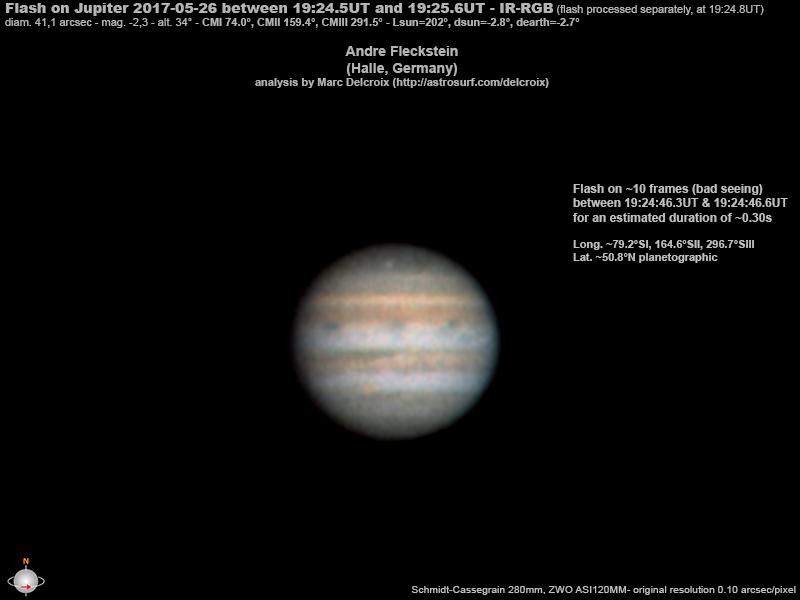 This afternoon Marc Delcroix, Damian Peach and Ricardo Hueso Alonso spread the news that Sauveur Pedranghelu in Corsica had probably recorded another impact flash on Jupiter yesterday - but there was no confirmation from another site, essential to rule out some flash (e.g. from an artificial satellite) close to Earth. I distributed the news and call for observations in various other Facebook groups and also on the Facebook page of Abenteuer Astronomie, a German astronomy magazine I'm with. Within hours in the comments to the latter posting I learned that Andre Fleckstein had indeed filmed the same flash! The time was 19:25:18 UTC on 26 May 2017, i.e. smack in the middle of the time interval given by Pedranghelu, and the duration was about one second. The quality of the video was described as poor, due to bad seeing, but one could see the flash well while it was running. Fleckstein also provided a quick screenshot, upside down w.r.t. Pedranghelu's image - and the flash is clearly there, as confirmed by Peach and Alonso. The Fleckstein video will now be processed further, and scientific analysis will follow. ADDENDA: a stacked version of Fleckstein's data, now in the same orientation as Pedranghelu's image, and a further processed version together with an explanation - and yet another confirmation of the impact, as a video clip and also nicely stacked the same way as the other two videos! Also a first report on and some more analysis of this triple success - and a depiction as space art, by a well-known Jupiter observer. Meanwhile an image sequence starting minutes after the impact or this hi-res image a bit later aren't showing any traces, typical for such events.